When is a time-relative pronoun¹ that joins a modifying clause. In the example below, the clause modifies a noun phrase (the years) expressing a time, a temporal location. The years when the "flower children" thrived were the 1960s. The "flower children" thrived then. The day when the concert takes place is Sunday. The concert takes place then. The hour when the parade begins is 12:30 p.m.
Where is a location-relative pronoun that joins a modifying clause. Below, the clause modifies a noun phrase (the city) which expresses a place, a physcial location. The city where "flower children" lived was San Francisco. The "flower children" lived there. The site where the concert will take place is Golden Gate Park. The concert will be held there. The street where the parade begins is Broadway. The parade takes place there. ¹The second mention of any noun phrase is usually replaced by a pronoun in order to avoid wordiness. (Last year was a difficult one.) The same is true when a noun is mentioned a second time in the next clause. (Last year was a difficult. I arrive here then.) The pronoun when can be used to refer back to the time-noun in the main clause. Last year [when I arrived here] was a difficult. When replaces the object noun in the modifying clause. The pronoun is fronted (moved to the front of the clause). Then the clause is placed directly after the noun that it modifies. When serves as a connector to the noun in the main clause. The year was memorable. You were born in that year. The year was memorable. You were born then. Where replaces the object noun in the modifying clause. The pronoun is fronted (moved to the front of the clause). Then the clause is placed directly after the noun that it modifies. Where serves as a connector to the noun in the main clause. The city is beautiful. You live in the city. The city is beautiful. You live there. Where can replace a relative pronoun for location—at which, on which or in which. The house at which I live is nearby. The address I work is 310 Elm Street. The library at which I study is downtown. The floor on which I work is the twelfth. The street on which I live is nearby. The island on which I live is Puerto Rico. When can replace a relative pronoun for location—at which, on which or in which. The moment at which he sent the text he fell. The hour at which I eat lunch is 12:00–1:00 p.m. The time at which I eat lunch is noon. The day on which I was born was snowy. The day on which I was born was Tuesday. The day on which I started school was June 1. The month in which I pay tax is April. The season in which I vacation is summer. The years in which I worked were 2017-2018. Also see Prepositions for Time (in, on, at) and Prepositions for Place (in, on, at). A clause that identifies the noun before it (tells you which one) is not set off with commas. No comma(s) is/are used. The object pronoun when or where may be omitted in an identifying clause. The area where the "flower children" lived was a colorful section of San Francisco. The years when the "flower children" thrived was a colorful decade. A clause that adds extra, nonidentifying information is set off with comma(s). The object pronoun when or where is required (cannot be omitted) in a nonidentifying clause. The Haight, where the "flower children" lived, was a colorful area in San Francisco. The 1960s, when the "flower children" thrived, was a colorful decade. An identifying clause adds information or narrows the noun to a specific one, group or lot. The clause helps by telling us which one. No commas are used. It is also called restrictive, essential , or necessary clause. See That vs. Which Some or All. A nonidentifying clause adds extra information about a noun already identified by other means, for example, by name, by shared knowledge or context. The clause, a comment, is set off with commas (before and, if necessary, after the clause). It is also called nonrestrictive, nonessential, or unnecessary clause. See Commas (adding comments). ¹An object relative pronoun cannot be omitted from (left out of) a nonidentifying clause. Compare your response to the feedback by clicking the "Check" or the "Check 1-10" button at the bottom. Monday is the day when we begin the work week. Monday is the day — in which on which at which we begin the work week. Midnight is the time when the date changes. Midnight is the time — in which on which at which the date changes. Three-fifty Main street is the address where you can write me. Three-fifty Main street is the address — in which on which at which you can write me. The lake where we swam was clean and clear. The lake — in which on which at which we swam was clean and clear. 2001 was the year when the new century began. 2001 was the year — in which on which at which the new century began. Seven o'clock is the time when I get up. Seven o'clock is the time — in which on which at which I get up. California is the state where I live. California is the state — in which on which at which I live . Parking lot D is the place where I parked my car. Parking lot D is the location — in which on which at which I parked my car. Summer is the time when people enjoy warmer weather. Summer is the season — in which on which at which people enjoy warmer weather. The backyard is the place where we can relax outside. The backyard is the area — in which on which at which we can relax outside. Every day hundreds of people pass through the San Francisco Ferry Building, a place where a variety of products and services are available. The San Francisco Ferry Building is the place where commuters catch their ferries at. It is also a place where people come to walk and watch activity on the bay. The area inside in which people shop for food is also where people can find restaurants and shops. Shops where you can buy meat, cheese, bread, mushrooms, plants, coffee, herbs, and so on. The Ferry Building was built at a time there were no bridges in 1875. People had to take a train to the Berkeley or Oakland ferry terminals, there they would catch a ferry to San Francisco. When the Bay Bridge opened in 1936, the Ferry Building became an unnecessary place at which the ferries were forgotten. In the 1970s, when the traffic on the bridge made the commute difficult, ferry boat service resumed. Now the Ferry Building serves as an activity center where San Franciscans shop, eat, catch transportation, and relax near the water. ferry (N) – a commercial service with terminals and boats for transporting persons, automobiles across small bodies of water. Decide whether the sentence is "correct" or "incorrect". Select your response—correct / incorrect. Compare your response to the feedback by clicking the "Check" or the "Check 11-20" button at the bottom. Every day hundreds of people pass through the San Francisco Ferry Building, a place where a variety of products and services are available. The San Francisco Ferry Building is the place where commuters catch their ferries at. It is also a place where people come to walk and watch activity on the bay. The area inside in which people shop for food is also where people can find restaurants and shops. Shops where you can buy meat, cheese, bread, mushrooms, plants, coffee, herbs, and so on. The Ferry Building was built at a time there were no bridges in 1875. People had to take a train to the Berkeley or Oakland ferry terminals, there they would catch a ferry to San Francisco. When the Bay Bridge opened in 1936, the Ferry Building became an unnecessary place at which the ferries were forgotten. In the 1970s, when the traffic on the bridge made the commute difficult, ferry boat service resumed. Now the Ferry Building serves as a center of activity where San Franciscans shop, eat, catch transportation, and relax near the water. 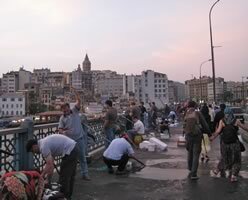 The Galata Bridge in Istanbul is a unique location in the world. It spans the Golden Horn at a site in which a natural harbor forms. It is the exact place in which the Bosphorus flows into the sea of Marmara. It is also the place at which the old Istanbul meets the new. This is the fifth bridge in this location. The last bridge was destroyed in 1992 the year in which a fire badly damaged it. The bridge has three car lanes and one lane on which trams go. In the evening, the time in which fisherman come to catch their evening meals, the bridge becomes a bustling place. Sunset is also the time at which the faithful are called to prayer. Tourists and locals walk along the first deck on which there are a number of restaurants and shops. Fisherman stand side by side at the railing at which they cast their lines into the water. Never is there a time at which the bridge is not completely occupied and bustling with people. cast (V) – throw, especially in fishing He cast his fish net. Change the which-clause to a when or where clause. Edit the sentence(s) in the text box. Compare your response to the feedback by clicking the "Check" or the "Check 21-30" button at the bottom. The Galata Bridge in Istanbul is a unique location in the world. The bridge spans the Golden Horn at a site in which a natural harbor forms. The bridge spans the Golden Horn at a site in which a natural harbor forms. It is the exact place in which the Bosphorus flows into the sea of Marmara. It is also the place at which the old Istanbul meets the new. This is the fifth bridge in this location. The last bridge was destroyed in 1992 the year in which a fire badly damaged it. The last bridge was destroyed in 1992 the year in which a fire badly damaged it. The bridge has three car lanes and a lane on which trams go. In the evening, the time in which fisherman come to catch their evening meals, the bridge becomes a bustling place. Sunset is also the time at which the faithful are called to prayer. Tourists and locals walk along the first deck on which there are a number of restaurants and shops. Fisherman stand side by side at the railing at which they cast their lines into the water. Never is there a time at which the bridge is not completely occupied and bustling with people. Murphy, Raymond. English Grammar in Use. 5th ed., Cambridge UP. 2019. "Galata Bridge." Wikipedia, The Free Encyclopedia. 18 Aug. 2016, en.wikipedia.org/wiki/Galata_Bridge. "Galata Bridge in Istanbul, Turkey." Lonely Planet, 2016. www.lonelyplanet.com/turkey/istanbul/sights/architecture/galata-bridge. "History and Renovation." Ferry Building, 2016, http://www.ferrybuildingmarketplace.com/history.php. Accessed on 26 Aug. 2016. "San Francisco Ferry Building." Wikipedia, The Free Encyclopedia, 22 Aug. 2016, .wikipedia.org/wiki/San_Francisco_Ferry_Building. Accessed on 26 Aug. 2016. "Flower Child." Wikimedia Commons. 5 Jul. 2016, en.wikipedia.org/wiki/Flower_child. Accessed on 26 Aug. 2016. "Haight-Ashbury Mural." By Seb Ruiz. Flickr. 2 Oct 2007. Licensed by CC BY-NC-SA 2.0. Cropped and resized. Accessed on 9 Mar. 2019. "Fisherman on Galata Bridge at Sunset." Resized. By J. Sevastopoulos. 2010. San Francisco Ferry Building." By JaGa, Wikimedia Commons, 5 May 2008. Licensed by CC BY-SA 4.0. Accessed 9 Mar. 2019.